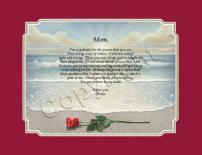 Your Mom will love this thoughtful gift personalized with your own sentiments specifically for her. 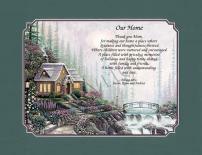 The perfect personalized gift for any occasion... a gift that will be cherished forever. Let her know just how special she is with this thoughtful gift for an amazing wife and mom. Perfect for Mothers Day, Birthday or just because she is amazing. Let your Mom know the things you appreciate about her with this thoughtful and caring poem. 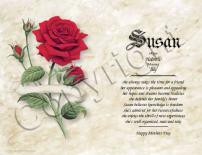 Add your own personalization to honor her and capture the occasion! It's a truly unique gift that says, in so may ways, "I love you". 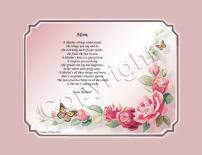 Your Mom will cherish this beautiful poetry gift personalized by you, her children. A beautiful and unique way to tell her just how much you love her. 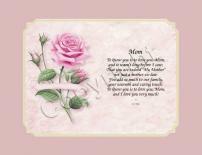 Tell your mother-in-law how much she means to you with this beautiful poem written just for her. A personalized gift that will touch her heart forever! 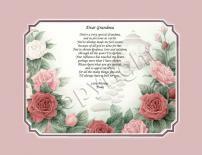 Design a truly unique gift for your grandmother that says exactly what is in your heart. 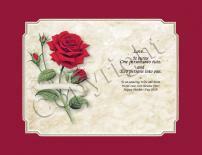 This beautiful personalized poem will do just that! This gift is the perfect way to let the "other mother" in your life know how much she means to you. Personalized by you, it will touch her heart and let her know how much she's loved! A special gift for your Mother. The meaning of her name with eight virtues. The perfect gift for her birthday, Mothers Day, or just because she is special.